The Milwaukee Brewers made some major changes Friday. The biggest move is shortstop Orlando Arcia headed to the minors for the first time since 2016. The Brewers optioned Arcia to Triple-A Colorado Springs and recalled versatile infielder Eric Sogard. 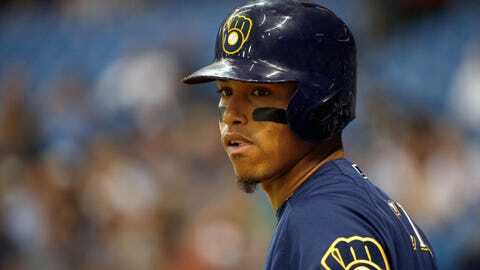 Arcia, 23, has struggled at the plate this season, and is hitting just .194/.233/.273 in 146 plate appearances. While still strong defensively, Arcia was hitless in his last 15 at-bats and 2 for his last 29. Sogard, who was sent to Triple-A on May 8, was hitting just .100/.194/.150 at the time. In 11 games at Colorado Springs, Sogard was batting .229/.255/.313. Milwaukee also designated catcher Jett Bandy for assignment, dealing either a player to be named later or cash to the New York Yankees for veteran catcher Erik Kratz. Kratz, who turns 38 in June, appeared in four games for the Yankees last year, and is hitting .269/.356/.538 in 60 plate appearances for Triple-A Scranton/Wilkes-Barre this season. The Brewers also optioned right-handed reliever Jorge Lopez to Triple-A, while fellow right-hander Adrian Houser was recalled from Double-A.